The Who were one of rock’s seminal bands, admired for their powerful, instrument-smashing stage performances, memorable hard-edged anthems, cinematic concept albums, and vocal and instrumental prowess. 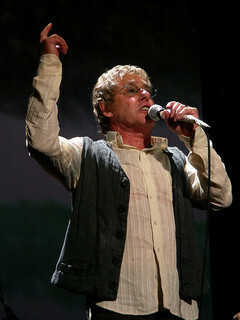 Roger Daltrey‘s angst-ridden, forceful vocals highlighted the works of chief songwriter Pete Townshend and many tracks also featured Townshend’s distinctive background vocals. 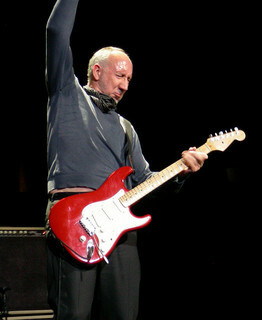 Townshend also took on lead vocals on some Who tracks in later years. Backing up the strength of the songs and these great vocal deliveries was the stalwart bass cornerstone of the group, John Entwistle, and the frenetic drumming of Keith Moon. The four combined to create a monumental group, who became a force by the late 60s after five years of relative obscurity. During this time they developed their identity with more typical early 60s fare but, by the early 70s, the group had released many game-changing albums including Tommy, Quadrophenia, Who’s Next, and Who Are You. After triumphantly entering the U.S. charts at #2 in Fall 1978 with new album Who Are You calamity struck when Keith Moon tragically passed away in his sleep on September 7, 1978. The cause was reported to be an adverse reaction to a drug prescribed to combat alcohol withdrawal, one of numerous vices Moon had struggled with during his career. Less than two years later Led Zeppelin’s John Bonham would also pass away. The sad result was that, arguably, the two greatest rock drummers of all time had been lost in the short span of two years. After much thought over replacing Moon, the group eventually chose Kenney Jones of the Small Faces (later Faces, who featured Rod Stewart on vocals) as his replacement. As a result, Jones drum work can be heard on later material such as 1982’s “Eminence Front” from the multitrack master examples below. Who’s Next was the favorite Who album of most music critics in that it contained the classics “Baba O’ Riley,” “Won’t Get Fooled Again” and “Behind Blue Eyes.” The album was produced by Glyn Johns, who also had a hand in other very successful albums from The Rolling Stones, The Eagles, Led Zeppelin and Eric Clapton, among others. 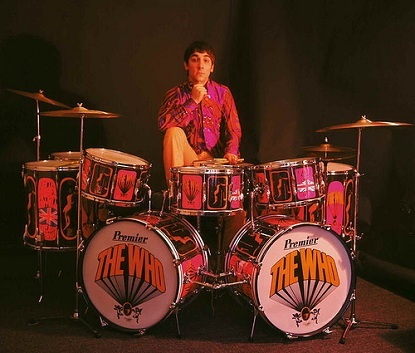 One thing Johns became known for in recording the music of The Who, and which you can hear in the examples of Keith Moon below from the Who’s Next album, was his simple method of recording drums. The method was not developed because it was simple, of course. It was used because it produced great sounding drums. Johns liked to use only four microphones. Two overheads placed equidistant from the center of the snare drum, one positioned traditionally overhead above the kick pedal location, the other positioned just above the level of the floor tom and pointing at the high hat. The key is the two mics had to be exactly the same distance from the center of the snare–around 3-1/2 feet or a little over 1 m away–and these two mics were panned hard right and left. The other two microphones were placed directly on the kick and snare. Standard placement was used on these microphones, although the snare mic was typically placed above the rim. As for Townshend himself, he played (and destroyed) a variety of guitars through his career, eventually more commonly using the Gibson SG in some of his better-known performances in the late 60s/early 70s. He was also a pioneer of using synthesizers in rock, developing the famous sequences for tunes such as “Won’t Get Fooled Again” on early synths/keyboards including the ARP 2500, ARP 2600 and Lowrey TBO Berkshire organ. Entwistle, famously known as “thunder fingers” on bass, played with a unique three-finger style that employed components of what would today be called plucking, tapping and slap bass, although not exactly any of those. Either way, his technique allowed him to play triplets easily and also to create wildly inventive bass lines.